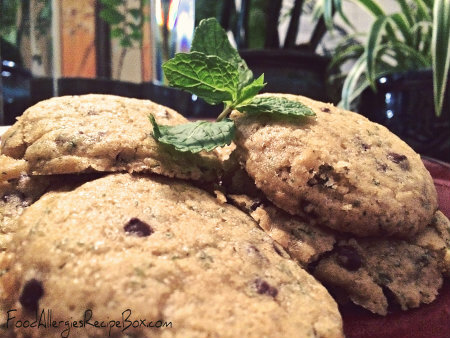 A delicious mint cookie recipe using fresh mint leaves! I love the idea of using fresh mint instead of an extract, you get wonderful green specs in this soft and tasty recipe with that fresh mint taste and aroma! Making this a perfect food allergy safe dessert recipe for any time of the year! This recipe is super quick and easy to make, it's amazingly delicious and I couldn't stop at just eating one! Best of all this dessert is an allergy safe recipe that avoids egg, dairy, and it's wheat free! I used earth balance butter in this recipe, so please make sure to read the label before purchasing this product for your family. Earth balance has quite a few different spreads just make sure to read the ingredients and verify that it avoids your food allergens and call the manufacture if you have any questions. You can view some of the facts about the butter spreads on their website. The ingredients for this spread says that it does contain safflower, flax and pea protein along with other ingredients. As you may already know peas belong to the legume family along with peanuts. Do you have a butter alternative that you use? Share with us on our online community on Facebook! We are always looking for new products to use to help us make more allergy safe recipes! Pre-heat your oven to 350 and lightly grease a cookie sheet or line with parchment paper. In a medium bowl lightly melt butter until soft and almost melted, mix in sugar, vanilla, milk and stir to combine. In a separate small bowl mix together the flour, salt and baking powder. Once ingredients are well combined slowly stir into wet ingredients and mix until it forms into a cookie dough and flour is dissolved. Finely dice the fresh mint leaves and toss into cookie dough along with enjoy life foods chocolate chips and mix together. Lightly grease a cookie sheet or line with parchment paper. Roll dough into tablespoon size balls and place on cookie sheet (approx 20 cookies). Place cookies into the pre-heated oven and bake for 10-12 minutes. I like to take out closer to 10 minutes and let them sit for a few minutes, they turn out a little softer. Plus you don't have to wait for them to cook all the way as this is a great dough that you could also enjoy raw! I have also placed the dough into the fridge overnight and for about an hour and still had success while baking. The slightly chilled cookie dough is easier to roll into balls. We also used Earth Balance butter for the pie crust that we made for this delicious sweet potato and acorn squash pie recipe! Return from Mint Cookie Recipe to Food Allergies Recipe Box!